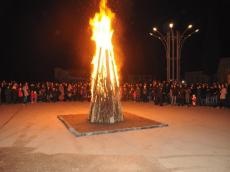 Novruz Bayram - a new month, new year and the cherished first day of spring – is closer with each passing Chershenbe (Tuesday). Od Chershenbesi notifies that too little remains for warm spring. It’s believed, on this day, the rays of the heavenly fire -- Sun, melts snow and nature comes alive. People say "A good beginning makes a good ending". So, it is very important for Azerbaijanis to celebrate this festive holiday with a clean house and a richly-set table. The table must be set with at least seven dishes. As part of the table setting, families will display a khoncha, a big silver or copper tray with semeni placed in the center, candles and dyed eggs for each family member around it. On this day, the groom will give his bride a khoncha with sweets and golden and silver adornments. The bride's family also has to send gifts to the groom's house.